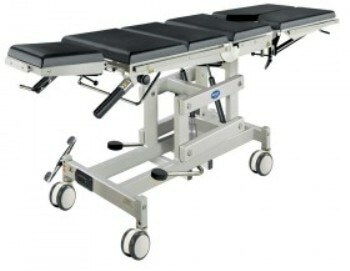 This table is designed for surgery, urology, gynaecology, proctology, laryngology, plastic treatments as well as other treatments, which do not require a function of table top lateral tilts. The table can be made of stainless steel. Table top is translucent for X-rays. Movable base, wheel with a central blockade. Height adjustment of the table top is carried out by a hydraulic foot pump. Trendelenburg and reverse Trendelenburg positions as well as back rest, leg plates and head rest inclination are assisted by gas springs with interlocking. Mattresses are removable, antistatic and seamless. The table is easy for cleaning and resistant to disinfection agents.